Groundwater quality of the Banana Plain (Mbanga, Njombe, Penja—Cameroon) was assessed for its suitability for drinking, domestic, and agricultural uses. A total of 67 groundwater samples were collected from open wells, springs, and boreholes. Samples were analyzed for physicochemical properties, major ions, and dissolved silica. In 95% of groundwater samples, calcium is the dominant cation, while sodium dominates in 5% of the samples. Eighty percent of the samples have HCO3 as major anion, and in 20%, NO3 is the major anion. Main water types in the study area are CaHCO3, CaMgHCO3, CaNaHCO3, and CaNaNO3ClHCO3. CO2-driven weathering of silicate minerals followed by cation exchange seemingly controls largely the concentrations of major ions in the groundwaters of this area. Nitrate, sulfate, and chloride concentrations strongly express the impact of anthropogenic activities (agriculture and domestic activities) on groundwater quality. Sixty-four percent of the waters have nitrate concentrations higher than the drinking water limit. Also limiting groundwater use for potable and domestic purposes are contents of Ca2+, Mg2+ and HCO3 − and total hardness (TH) that exceed World Health Organization (WHO) standards. Irrigational suitability of groundwaters in the study area was also evaluated, and results show that all the samples are fit for irrigation. Groundwater quality in the Banana Plain is impeded by natural geology and anthropogenic activities, and proper groundwater management strategies are necessary to protect sustainably this valuable resource. This write-up constitutes part of data generated during the PhD study of the corresponding author, who is supported by Monbukagakusho Scholarship from MEXT (The Japanese Ministry of Education, Science, Sports and Culture). Material support was also provided by Grant-in-aid for scientific research No.21-606 from SASAGAWA Foundation, Japan (Japan Science Society). Thanks are due to the anonymous referees of the journal, who helped immensely in rewriting the paper in terms of content and language. Environmental Protection Agency (EPA). (2009). National primary/secondary drinking regulations. EPA 816-F-09-004. 6 pp. /http://www.epa.gov/safewater/contaminants. Garg, V. K., Suthar, S., Singh, S., Sheoran, A., Garima, M., & Jain, S. (2009). 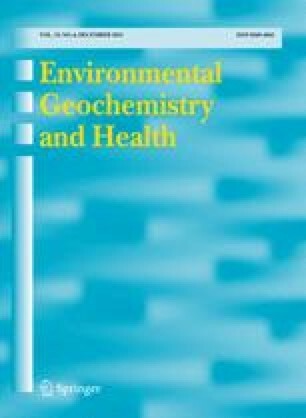 Drinking water quality of southwestern Haryana India: Assessing human health risks associated with hydrochemistry. Environmental Geology. doi: 10.1007/s00254-008-1636-y. Nagarajan, R., Rajmohan, N., Mahendran, U., & Senthamilkumar, S. (2009). Evaluation of groundwater quality and its suitability for drinking and agricultural use in Thanjavur city, Tamil Nadu, India. Environmental Monitoring and Assessment. doi: 10.1007/s10661-009-1279-9. UNICEF. (2007). Predicting the global extent of arsenic pollution of groundwater and its potential impact on human health. http://www.physics.harvard.edu/~wilson/arsenic/references/Ravenscroft_Prediction.pdf. WHO. (2001). Water health and human rights, world water day. http://www.worldwaterday.org/thematic/hmnrights.html#n4. Accessed 20 May 2010.